Cold Antler Farm is not a warm place to wake up at. At least not outside the covers. Under a pile of wool with gibson sprawled beside me there is enough heat to rise bread, but outside this sanctuary the farmhouse teeters around 45 degrees. Because I know how cold that floor is under bare feet and because I have no desire to experience it at the moment — I reach out just far enough to grab the sketchbook on the night stand. Along with a mechanical pencil I sink back under the covers to start the day's list. It is an act of equal parts productivity and procrastination. I'm getting my day planned but doing so in the warmest, farthest, and safest spot from the work. Gibson curls his spine into my belly and lets out a sigh. He is fine with ten more minutes. I start the list with things I do without even thinking. These aren't tasks, they are habits, but it allows me start off the day with feeling like I accomplished something and that is a morale booster of the highest caliber. So I write things like: feed cats, let out dogs, start fire. You know, things of that nature. I list all the things I do indoors before chores including getting dressed. 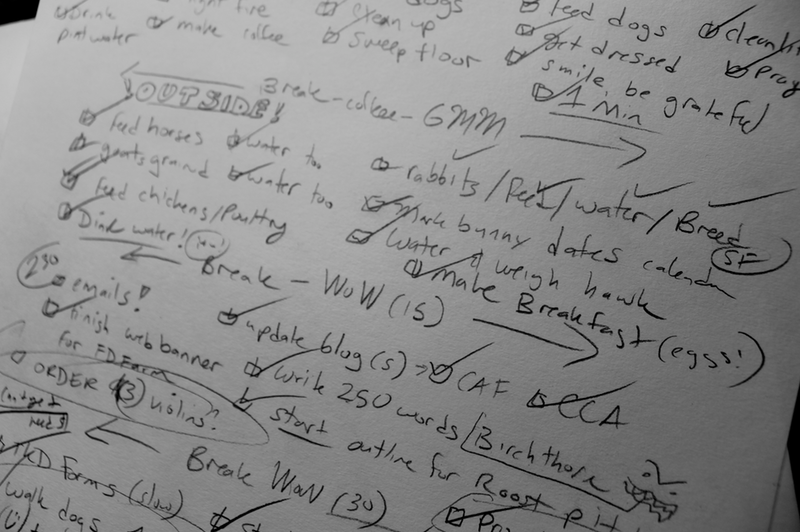 I also write down the things I probably won't do without the list to guide me. Things like: pray, smile and breathe slowly for one full minute, and think of things you are grateful for. Then I make the list continue to outdoor chores and office work. I block it into sections with breaks that include watching Good Mythical Morning on Youtube with my coffee and fifteen minutes in Azeroth after emails. It's an odd combination of work and rewards. Timeless tasks of feeding horses hay and breeding rabbits followed emails and computer games. I never said I wasn't contrary. and cold the lessons they will teach. May I receive them without flinching. I love this prayer. As I recite out loud Annie comes and flops beside me. Gibson (not wanting to be left out) flops on my other side and I feel as strong as Artemis. I am lit by firelight, flanked by hounds, and above me a big deer head glows in the ember light. This is how you start a day. I check all of it off the list and flop on the armchair with a hot cup of coffee to enjoy Rhett & link talk about movie posters. This is going to be a great day. I check the weather after my coffee and smile at the number. It is warm enough to wear a kilt without tights under it and I get dressed in my favorite, beaten down, green canvas chore kilt and head outside. My only armor is my rubber boots, wool socks, a scarf, a knit hat, and a padded canvas work vest over a wool sweater. 18 degrees might as well be May's glory because the sun is shining and my knees are bare! Gibson is outside with me, running around the way only a border collie can after seven hours of inactivity. Together we are light and ice. I tend to all the animals, remembering the list and do the extra chores of the day: breeding the Silver Fox rabbits. When the horses, sheep, goats, birds, and rabbits have been seen to I come back inside for a little more coffee and check my knees. They are red as can be but holding up just fine. I return outside with my falconry glove and a quart of water for Italics. Every morning he needs to be weighed and fresh water offered in his bath pan. He chirps at me in greeting as I enter the mews and I check his weight and smile. He is perfect for hunting. When I got back inside I add it to the list. I'll go hawking after lunch if my work is done before. With the animals seen to I return inside with a panting dog and a lighter heart. I may drink coffee and watch my morning program before the animals are fed but I wait until after they eat to break my fast. I get three of the eggs from Patty's chickens out of the fridge. My birds aren't laying yet (or are hiding them in the upstairs of the barn), so I am enjoying someone else's bounty. I scramble three with salt and pepper and enjoy every bite. The following hours are spent in the office with a few breaks to get more water or add more wood to the stove. By mid morning I have brought the temperature up to 58 degrees and I am grinning. I answer emails (240 since last night). I update both the blogs, write more of Birchthorn, work on freelance design jobs, start a book proposal, and promote a workshop for October. I check them all off the list as they happen. A few hours later I am ready to move again. I make time to slowly move through my 12 Taekwondo forms in my living room. It is more like Tai Chi than kata and I move slow enough to realize which muscles hurt and which need more attention. When I have gone through them all I stretch. I stretch for a long time. It matters. When I am feeling warmer and more flexible I do the forms again, fast, with power and purpose. Artemis, can you see me now? I take the dogs for a mile walk and feel happy to be out in the sunlight with my kilt again. Pants are the worst. I am listening to The Name of The Wind for the 3rd time on audiobook while I walk with my kind dogs. The plows have moved just enough snow off the edge of the road to feel earth under my feet again. It has been a while and I walk on it with a light heart. It is well after lunch by now and I load up Italics and my hunting gear and head into town. I stop for a sandwich to fuel me for the afternoon hike. We hunt over at Common Sense Farm and when I arrive I am shocked at the cold of the open fields. I live on a mountainside, protected from winds. Common Sense is down in the valley and more exposed. I feel them die off and grab my bird and hunting satchel. We head off into the rabbit thickets. Italics and I spend about an hour outside together. We are in a wild place. I let him fly free and he perches in a tree to watch me flush game. I do this (without finding any rabbits, the snow is still deep and they are clever) and walk along the trail with my staff. He follows me and I am glad. I call him to me and he flies to the fist three times. We are a team, and I push through brush and pricker bushes. I walk through a knee-deep creek. I feel invincible and happy. The wind is gone and the sun is back and when I raise my fist to the sky my good hawk flies to it and lands with grace. It took a year to feel this, to know this. I could care less if we catch a rabbit. I have caught the moment. I smile. I am tired. I have been up since dawn. I have worked and sat, punched and kicked, stretched and hiked and now I have hunted. I am ready to end this day's adventure and we head back to my truck. Italics goes back to his carrying crate with a full stomach of food I brought along as a reward for his attention. I head to the mansion where the Commune's majority live. I walk inside and up the stairs to my good friend Yeshiva's apartment. She's home and her new baby and toddler are napping, her older kids are at school. Perfect timing. She invites me inside for tea and tells me about the mountain lion tracks found in the rabbit thicket. I raise an eyebrow and she shows me the photos, the measurements, the 20 inch span between the strides. A brother called the DEC and they confirmed it, but set up a game cam to be sure. There are lions in these parts! I hugged the mug with two hands and listened wide eyed. It was quite the tale. She told me about the deer they found ruined apart in the woods, the tracks and how far they went around the outskirts of town. I felt like one of the characters in Birchthorn. It was a quiet thrill from the safety of a mansion with a hot drink. After my visit and tea I headed to the barn at Common Sense to get hay. I only needed a few bales and I climbed up the ladder into the third story of the ancient barn. Ancient, but not in poor shape. I found myself in the glow of the afternoon light streaming in and on my warmed face. The light lit up the peafowl and pheasants n their three story aviary. Birds of storybooks perched on trees and limbs hung from ropes and rafters. I wished music was playing. 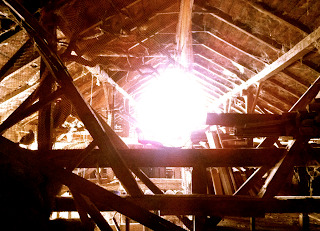 No cathedral on earth knows the blessed humility of a barn loft in afternoon light. By now it was nearly 4PM and I needed to return for evening chores and to tend to the fire. I did so and was happy to report the sun stayed with me. When all the animals were taken care of I headed inside to enjoy the evening. All office work usually stops by 5PM and I was thrilled to have nothing to do but pour a little bourbon in a mason jar and stretch out my tired limbs. I still felt that smile from the morning prayer session. I still felt that wash of gratitude. My life isn't perfect, not by a long shot. But today was kind of wonderful. I got to care for my farm, work towards my goals, hike and hunt, and spend time hearing stories of monsters with good friends. I ate good food. I came home with hawk I set free. I am still smiling, maybe because I simply chose to enjoy the day a few moments after meeting it. It was a glorious day and I look forward to doing it again. To starting that cold morning list and taking time to sit, pray, and smile. You get what you ask for. You just need the courage to ask. Some times it takes a list. Some times it takes a prayer. Some times it takes good friends and holy light. So be it. Beautiful, my friend. What a wonderful day you had...thank you for sharing. I love Rhett and Link! Thank you for sharing your day and your prayer. Smile and breathe sounds like a wonderful way to start the day--I'm going to start doing it. I find myself smiling just from reading your words. Ah yes...sometimes writing *everything* down and checking it off keeps the mind untangled so as to be more easily reminded of the simple joys we can appreciate. 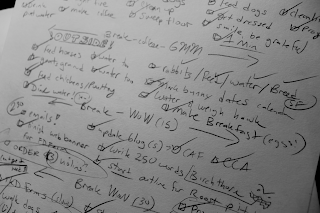 I sometimes label my list with 'fun' chores as rewards for checking off the 'bad' chores. Worth being five extra minutes late for work to read this today. Thank you. You have posted many times about "what I did today." I love the fact that you are still in love with your every day, enough to be inspired to put it down in words. Whatever your shortcomings may be, you carry a grateful heart, and that's a lot more than most people can say. Amen! Thanks for the reminder today and always! Wow Jenna, this was just amazing. You are a strong and courageous girl, and I admire you.